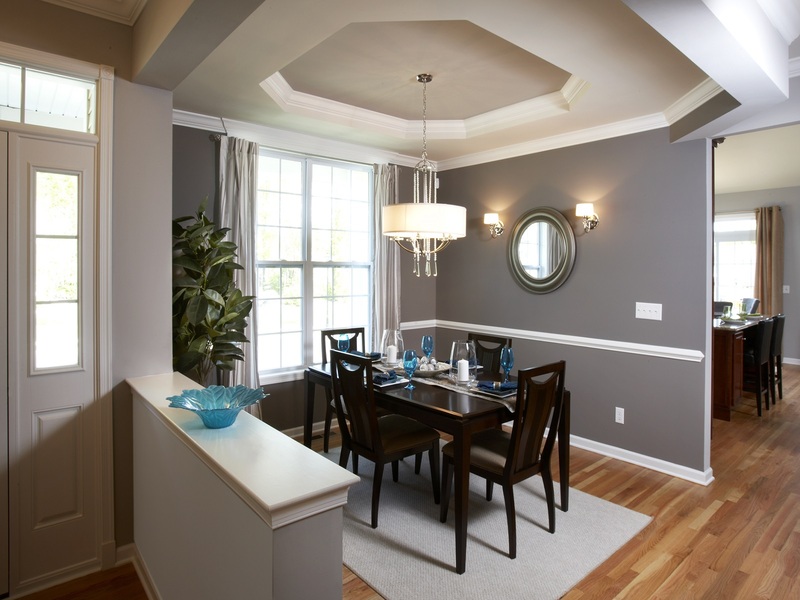 Deep brown espresso furnishings paired with the warm grey wall color create a sophisticated entry as well as dining space – the first room that welcomes guests to the home. Touches of teal accents add a burst of color. The modern, elegant chandelier adds a touch of opulence. The cream ottoman offers contrast against the deep grey furnishings in this living space. Placement of the artwork above the couch draws the eye up to highlight the rooms architectural details. Beautiful accessories throughout the space complete the room. The warm grey and deep brown tones in the gorgeous master retreat create a calming, serene space. Plum pairs well with the grey as an accent color for other textiles in the room. A chandelier – unexpected for a bedroom – and art decor mirrors complete the room’s sophisticated design. Emerald and teal tones have been the color of 2013. 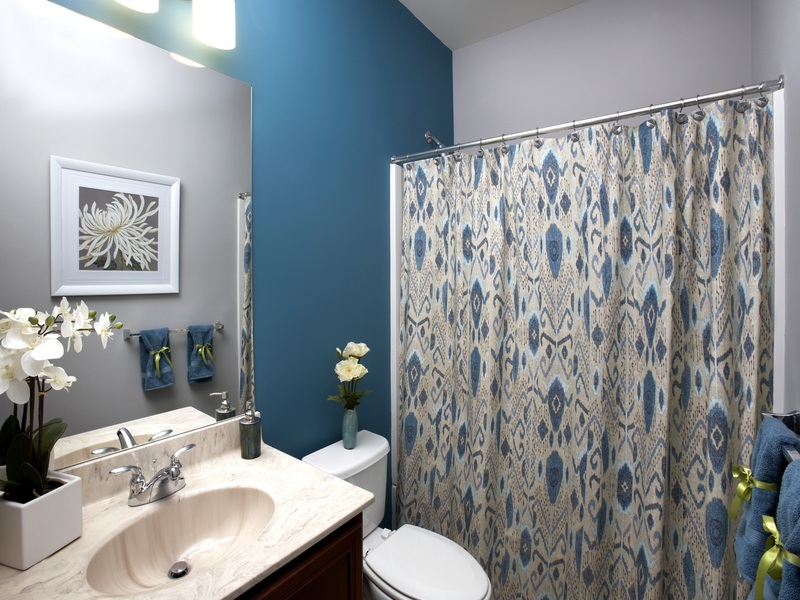 This teal accent wall creates a wow in this second bath and is complimented by the additional teal accessories and natural accents. PJ & Company Home Styling, LLC offers in-home decorating and staging services to clients in Connecticut, New York, and Massachusetts. Patti Stern, PJ & Company’s principal, interior decorator and accredited home staging professional, and her team, work closely with individuals to redecorate, renovate or simply refresh their home décor. 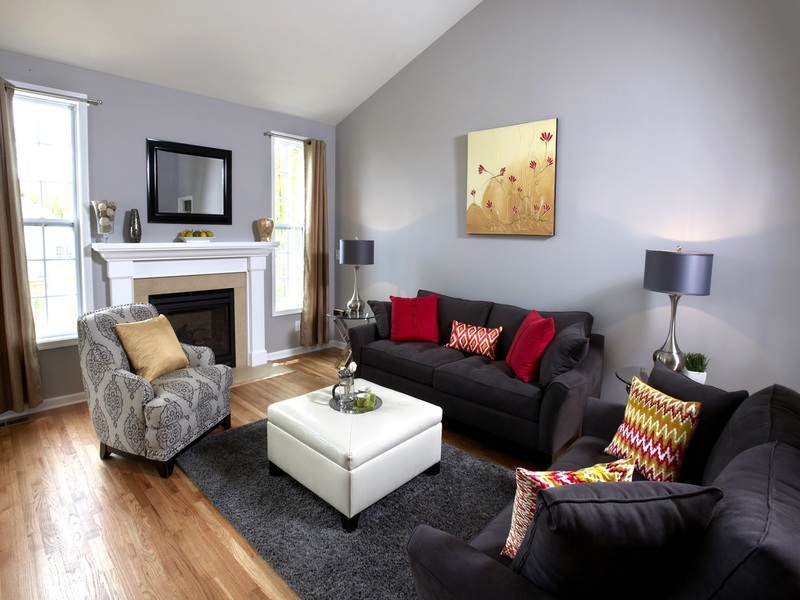 She also offers comprehensive, turnkey staging services to help homeowners sell their home quickly and for top dollar. For more information, please contact Patti Stern at 203-640-3762 or patti@pjstagingdecorating.com.